The hype is building around AMD’s upcoming Zen chip (due at the end of 2016), but if you’re calling it a CPU, you’re off-track. That’s because the first iteration of the company’s new microarchitecture, code-named Summit Ridge, is actually an SoC, or System on Chip. Confused? That’s understandable, says Kevin Krewell, principal analyst with Tirias Research. Krewell says some people even consider Intel’s Xeon D chip to be an SoC even though it’s actually two separate dies, or chips, inside a single package, which has traditionally been called a System in Package, or SiP. In the case of Summit Ridge, AMD will integrate the CPU with a memory controller (although the number of channels is undisclosed), as well as PCIe, SATA, and USB functionality. AMD’s AM286LX was dubbed a “motherboard-on-chip” in the 1990s and integrated a memory controller, bus interface, CMOS memory, and real-time clock. The reason we care whether Zen is a CPU or an SoC is reputation. The PC enthusiasts, who follow CPU advances closely, equate SoCs with chips for lower-power mobile devices like smartphones and tablets. They wouldn’t be caught dead with an SoC in a real computer. At least not on the face of it. Krewell believes the company made the design choice so Zen can scale. “The market for PC processors like [AMD’s mainstream SoC] Bristol Ridge is driven by the requirements for notebooks—this is where having a fully integrated SoC makes the most sense.” With the SoC design, AMD can easily put Zen chips in laptops, NUC-style mini PCs, and big desktops, as well as servers. The SoC design makes another important difference: By integrating a memory controller, PCIe controller, SATA, and USB into the actual die, AMD is able to build those individual functions on the same leading-edge process technology as the SoC itself. This makes the entire system more power-efficient. Intel, by contrast, builds its CPUs on a 14nm process, but the chipset is on an older 22nm process. AMD details its consumer and mainstream AM4 chipsets, but its enthusiast chipset is still shrouded in mystery. Of course, you’re probably wondering how a chip that goes into a laptop or tiny PC can possibly suffice for big gaming desktops, which need far more storage and I/O. Although AMD hasn’t revealed its full plans, the company’s Bristol Ridge SoC provides some hints as to how Zen might work. Despite the similar-sounding name, Bristol Ridge is based on the company’s older microarchitecture, built on a 28nm process. Nevertheless Bristol Ridge for desktops will drop into the same AM4 socket as Zen. The Bristol Ridge chip itself will feature support for x8 PCIe Gen 3, a dual-channel memory controller, four USB 3.1 5Gbps ports, and two SATA ports, plus support for PCIe storage. By plugging Bristol Ridge into an AM4 motherboard, you pick up additional USB, SATA, and PCIe ports. And as Krewell notes, the same chip can be plugged into a mini NUC-style PC without a chipset to save space. AMD officials say the Bristol Ridge chip connects to the chipset using a x4 PCIe Gen 3 connection. Because Summit Ridge is a performance chip, it’s expected to pack far more PCIe lanes and its chipset will likely feature more I/O than a mainstream chipset. One report from German tech site Planet3DNow.de claims the top-end chipset will be called X370 and pack support for 32 lanes of PCIe Gen 3.0 bandwidth for multi-GPU configurations. AMD’s Zen will fit into the new AM4 socket and appears to support dual-channel DDR4. It won’t work with existing AM3+ coolers without a new bracket. While the number of PCIe lanes is hearsay, we have confirmation from AMD that Zen will be compatible across AM4 boards. AMD officials told PCWorld that AM4 is designed so you can buy a Bristol Ridge-based PC today and upgrade it later to a Summit Ridge chip if the system maker offers an upgraded BIOS. Users might not be pleased to learn, however, that AM4 systems will feature different mounting. 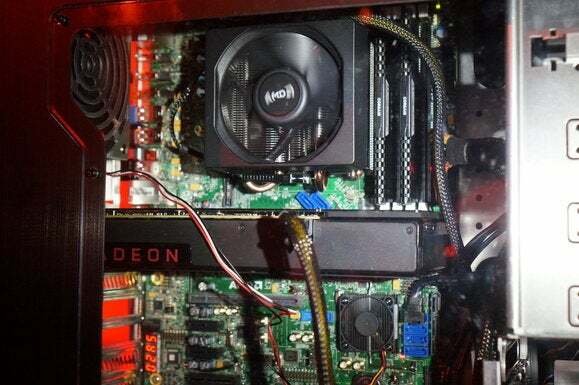 AMD officials confirmed that the holes in the motherboard have been changed slightly, which could be disheartening to anyone hoping to recycle an existing cooler. It’s possible the cooler dimensions themselves will stay the same, in which case, you might only be on the hook for a new bracket. For now, we’ll have to wait and see.